The luxurious interior of Car 85, Gravetye Manor comes to life as 5BEL Trustee Doug Lindsay polishes a glass to go with the newly designed crockery and cutlery.The new table lamps – specially manufactured – sports its replica opalescent shade. These were made from the latest ‘wonder material’, plastic in 1932 and cost a lot today! This photo, together with details of the new funding initiative COOL BRIGHTON BELLE Features in the DONATE section of the site – will you help us? One of the famous Brighton Belle Pullman armchairs is stripped of its old British Rail Moquette, ready for covering in the newly woven, genuine, Brighton Belle textile that Is still available from the original pattern, but with an up-to-date fire certificate. Supremely comfortable, for some these properly upholstered chairs bring instant repose to those fully satisfied with an exceptional dinner. One of the key differences aboard the Art Deco, Brighton Belle was that all the brass Metalware was beautifully nickel plated – not chromed, that would be too garish. The Restored Brighton Belle has had all the original fittings re-plated, so that they fill the sumptuous Interior with a silver sparkle. These hatracks, for ‘light luggage’ are a distinctive addition to the beautifully recreated train. The famous first class coupé in Car Doris is seen here in January 2018 with its woodwork partially reinstalled. The luxury formerly on offer here will return with interest. It will be a much sought after space in which to make a journey and to enjoy a top-quality meal. 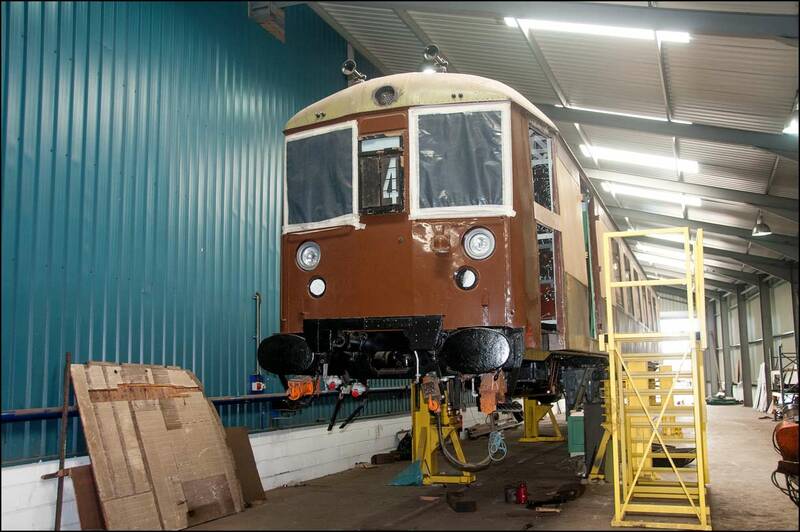 Motor Car 88 has nearly completed its electrical work in WH Davis Works in this view in January 2018. The interior wiring and lighting is being completed, and the interior of palled walnut is being replaced. 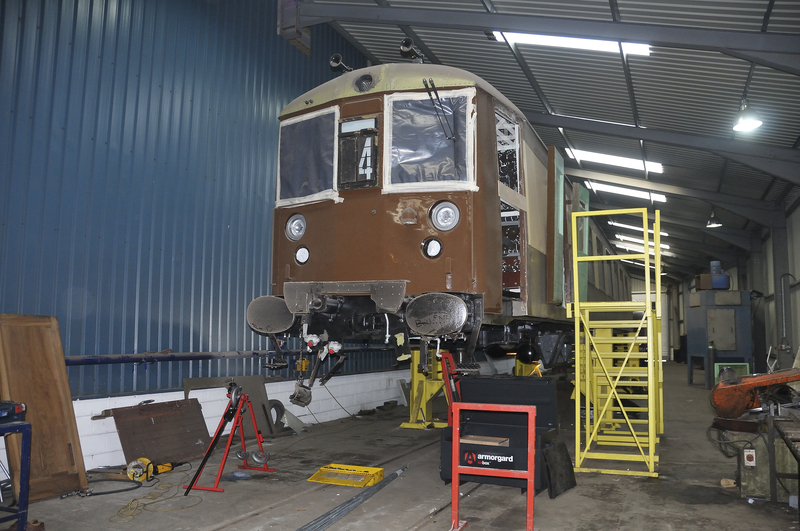 Soon it will be ready for lowering on to its BR Mk6 power bogies and then be ready for main line testing. 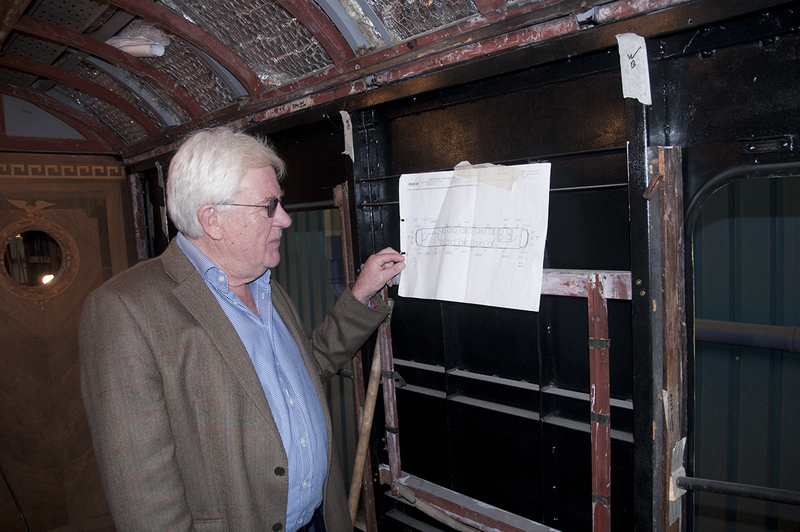 5BEL Trustee Mike Hart stands inside first class Car Doris looking at the interior plan. 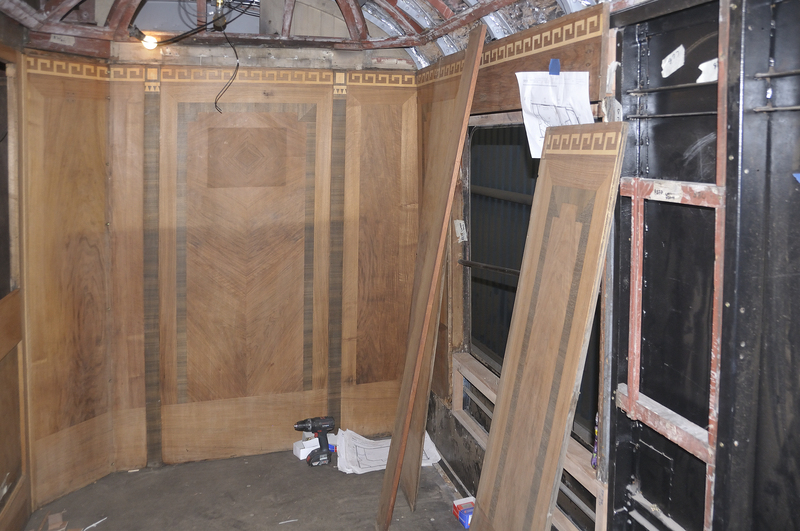 Behind him is a refurbished marquetry panel and all around him are the basic wooden fitments to which the beautiful panelling will be affixed. This car has made massive advances in such a short time, from being reduced to a shell at the start of the year. It has had major work on the steelwork after the extraction of asbestos, and now it is coming together rapidly with the final stages of interior fit being undertaken. 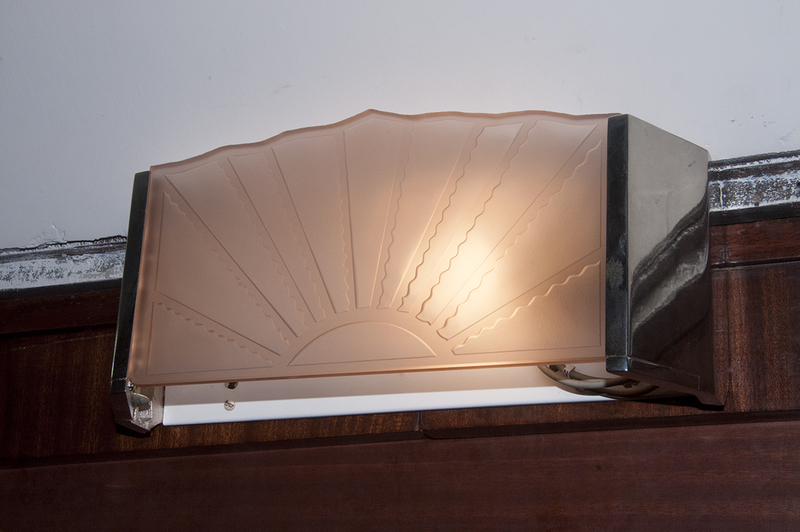 Special wall lights were designed and executed in 1932 specially for Brighton Belle. 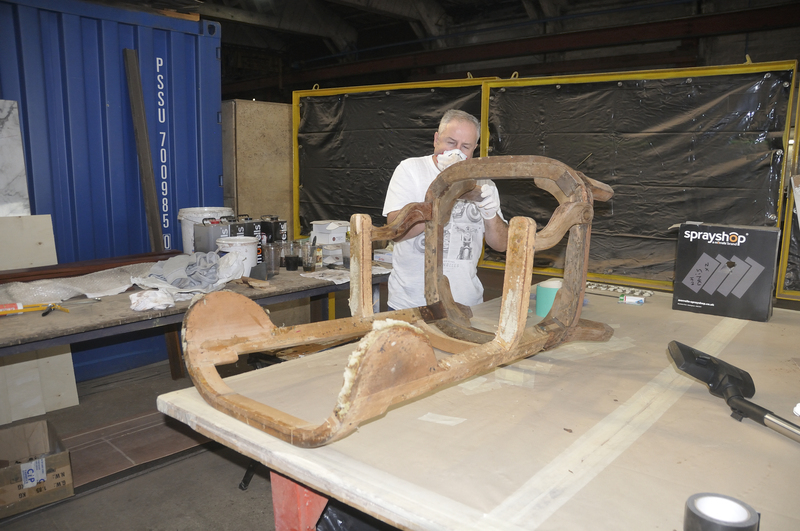 This is a reconstruction placed in position so the Trustees could see it. 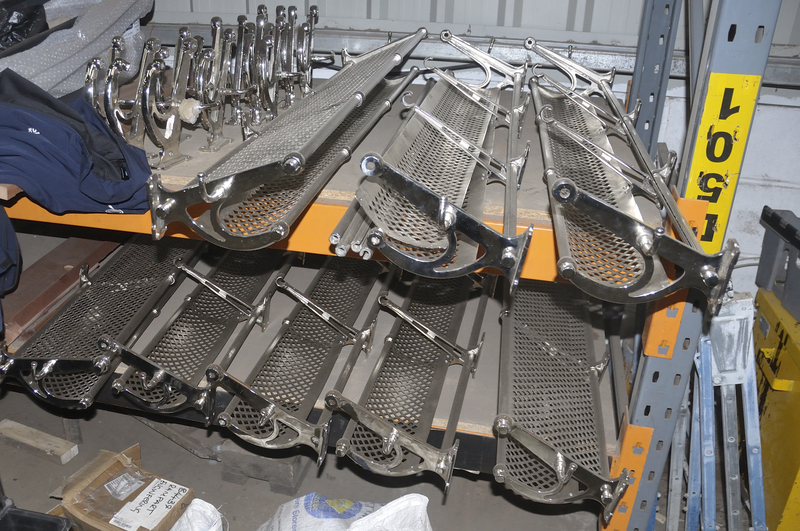 The metalwork has been replated to give a clean nickel finish. The original lamp glasses have been replicated in the original sunbeam pattern and the bulbs are not filament high-energy using bulbs. Instead they are new LED bulbs, designed to offer ambient light indistinguishable from and old filament bulb, but using a tiny fraction of the energy. In total the reduction in lighting energy has allowed real relief for the electric motor generator sets on the train. 5 BEL Trust Chairman Denis Dunstone looks on in approval at the parquetry design in Motor Car 91. Much energy, time and expense has gone into recreating to perfection the original 1930s Art Deco designs. His smile indicates the superb quality that has been achieved. The Trust is determined that this train will be restored and will operate to the highest standard. 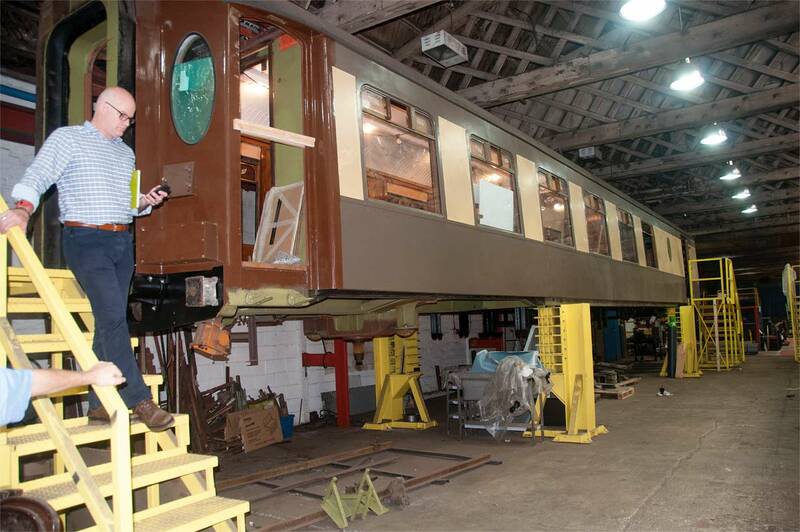 Car 91 is now having the final details of its interior reconstruction completed, and then the seating will begin to follow. In the roof, lamp sockets held miniature globe bulbs in very railway-like poses. Pullman designed and fitted ground-glass tulip-style shades, which we have managed to have manufactured new, as well as using stocks already available. Watchful for the recreation of the original effect, one of the ‘bluer’ LED miniature globe bulbs is being tested here in the roof-light strip along the saloon of Car 91. 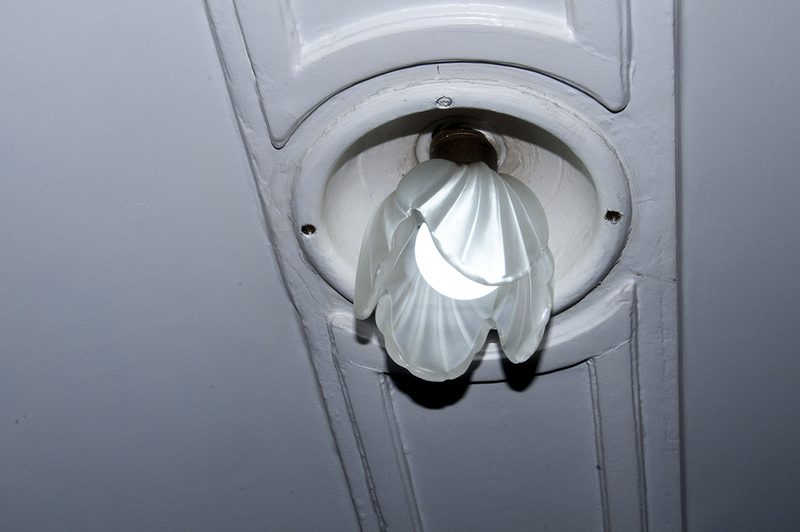 The effect is good, but these bulbs will probably populate the corridor and vestibule spaces. It is worth going to the trouble to get this right – it all adds to the authentic Pullman atmosphere that we are able to recreate with this careful Art Deco reconstruction. 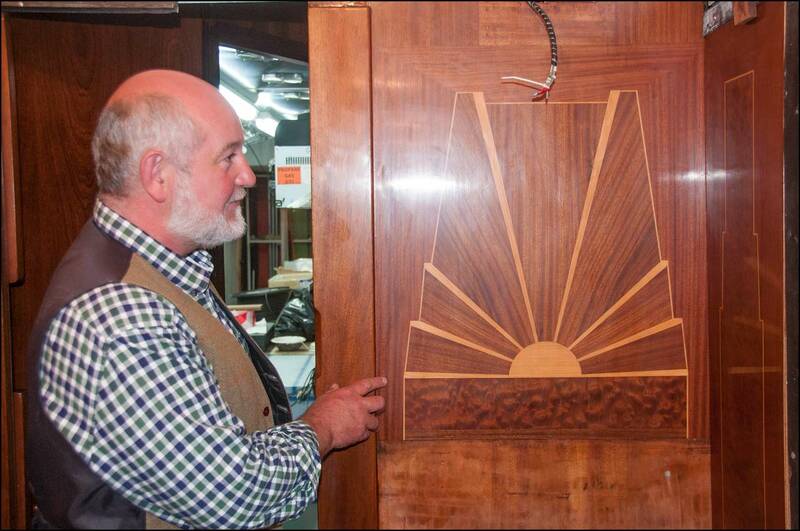 Nigel Heldreich from the famous marquetry firm of Wheathills, Near Derby, examines some parquetry that his team remanufactured for the interior panelling of Car 85, that has not become kitchen saloon. This sunburst design adorned the original vehicle and is typical of the Art Deco period in which the train represents. To have restored the design so exquisitely is a major feat that gives Wheathills as well as the Brighton Belle team a great deal of pleasure. Alas the original parquetry was destroyed by prolonged exposure to damp and rain, that managed to gain entry through the rotting metal roof during Car 85’s rather unfortunate period of almost dereliction. It’s safe now! 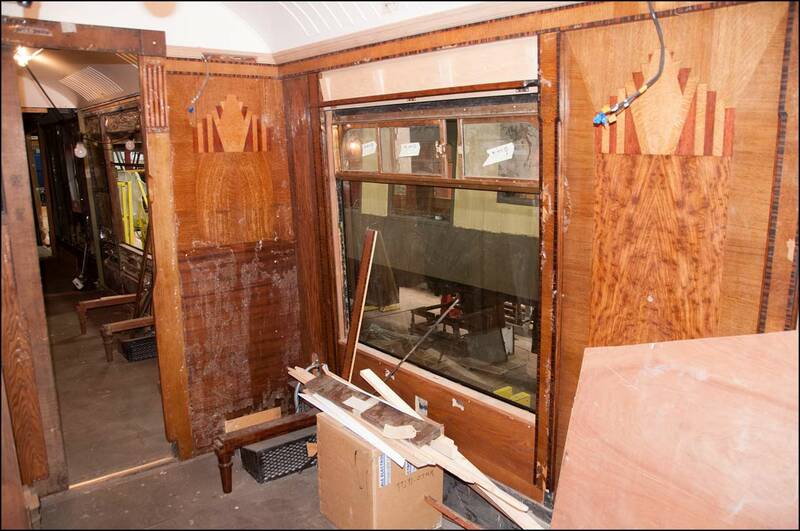 During the disturbance of interior fit comes the trying out of various new and restored artefact’s to restore Brighton Belle to the glory it offered in the 1930s. After much thought and discussion it was decided that the best way of restoring the tables was to make new ones. 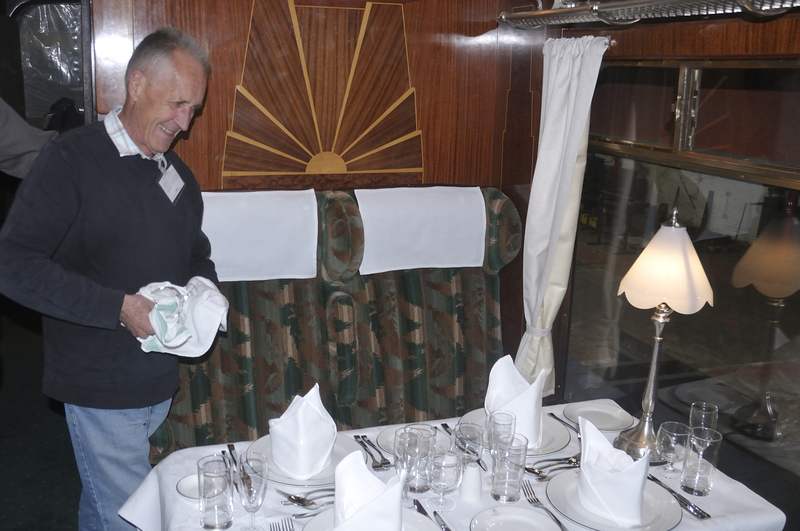 All the seating arrangements were being changed from 2+2 to 2+1 across the former third class cars, and so it followed that all the tables would need to be changed as well. 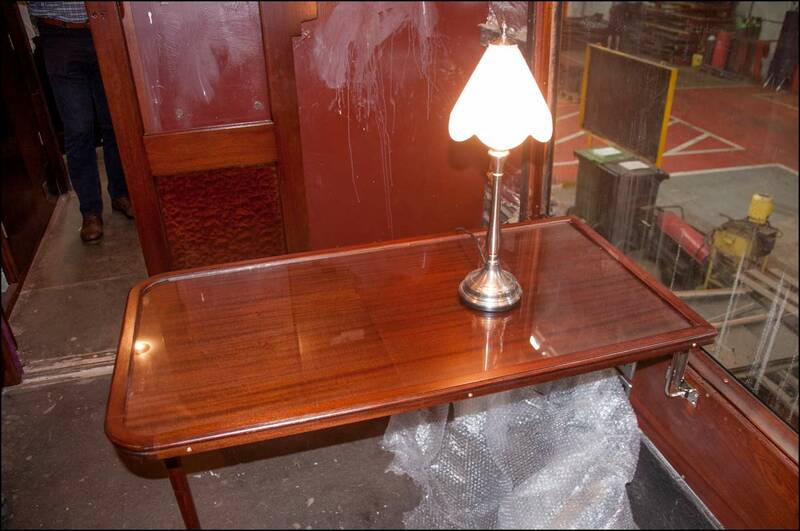 Here is the first of the glass-topped tables, offered up in the interior of Car 85 – it looks splendid. Note too the newly made Pullman table lamps and remanufactured plastic shades, facsimiles of the originals – magnificent! In Car 91 the original ‘coffee pot’ parquetry of the 1930s has been carefully replicated or restored, as appropriate. What was not obvious before starting was the effect of current legislation against fire. Varnish coverings must comply with the new standards, and this requires some experimentation to make sure that the expected deep shine of the fresh woodwork will also comply with the new standards. This has proved a problem across the wide range of humidity and temperature that railway vehicles must accept. So getting a resilient, compliant surface that offers the expected deep shine has taken time. This typifies the project – it all takes time! As the concept of the Brighton Belle restored to the main line is to offer fine dining, then a splendid kitchen is a prerequisite. Thus former third saloon Car 85, whose interior was much damaged by water ingress, has had a kitchen installed in one saloon, with the other saloon restored to Art Deco glory. 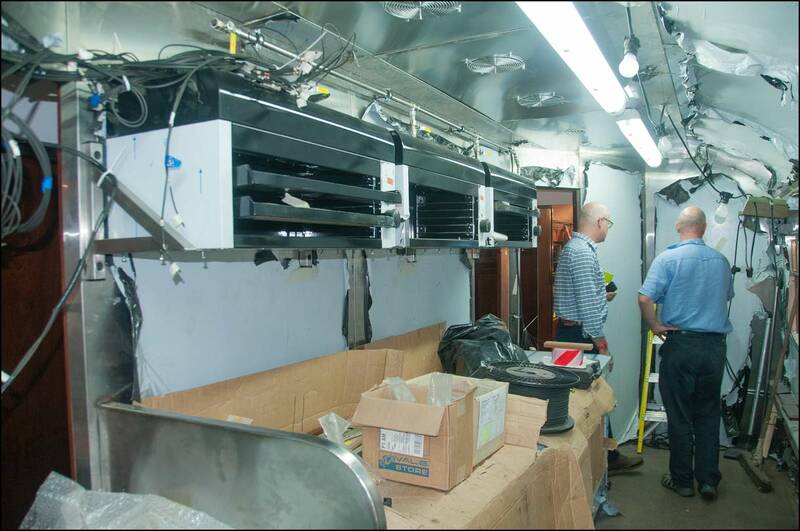 Here is the modern kitchen, with the gas-fired burners under the cardboard. Next door, kitchen to kitchen will be Car Doris, so the two kitchens will work together to be able to serve 175 people a splendid meal to remember in opulent Pullman surroundings whilst gliding through the Garden of England. Sounds good, doesn’t it? If you were not convinced that restoring this train is deeply expensive, difficult and time consuming, then this story may convince you. This is the shell of first class saloon Car Doris. Said to be in ‘reasonable’ condition, this was hardly the case. The interior was half stuffed with asbestos, and significant parts of the metalwork resembled lace! Filler and a spot of paint is not acceptable for 90mph capability trains, so any substandard material had to be cut out and replaced with solid stuff before the whole was mounted on a ‘tonka’ underframe to take its B5 bogies. Most of this has happened. The floor is now in, and restoration of the truly splendid interior begins. 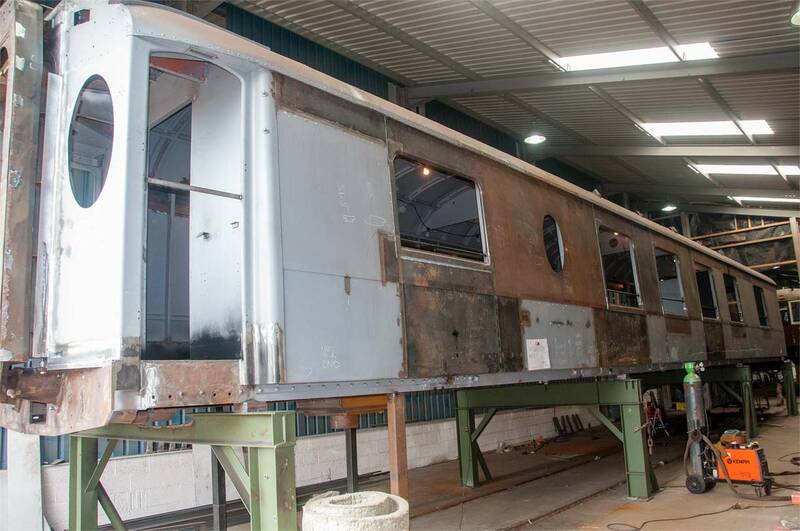 This is Car 88, and for those who are familiar it hasn’t changed very much at all for quite a long time – except that its interior is coming along rather rapidly. The problem is hidden from view. Perhaps the most difficult task to deal with has been the electrical side. Apart from the maxim that you take no chances were electricity is concerned, it is hardly surprising that todays safety bodies are clear that 1930s wiring is not welcome, and that the whole train must conform to the latest safety standards. So what’s been happening is all ‘behind the scenes’. The entire electrical system has had to be replanned and then replaced – and to the very highest standard. Guess what – this all takes time! Car 91 is the other Pullman power car, and it can be seen, with underfame and bogie spigot, ready for the ex CIG BR Mk6 power bogies to but placed underneath. The interior of this car is progressing well, as can be glimpsed through the windows. The electrical wiring is what is taking the time. Some unusual changes have been needed for this car. Note that it has an end window – unusual in a Pullman. The loo has had to be moved to the front of the car, as it was decided that this would be where we would invite the mobility impaired to travel with us. As a result the loo’s in the front and an extra bay of seats has been added at the back – and that is unusual! The decision was also taken to make the lot retention toilets too.